AutoFORM LaserNet provides automatic document routing and handling facilities in the form of a series of optional modules. These are fully integrated processes that work in conjunction with your ERP and accounting applications. Together, they enable you to arrange for your documents or sets of documents to reach the right people when they For example, if you need to send purchase orders using your suppliers own XML schema, or want them and by their chosen method whether that be XML, email, fax, post, or network printed all without operator intervention. If a customer would prefer invoices by post, despatch advice notes by fax and statements by e-mail AutoFORM handles this instantly & automatically on a company by company, document by document basis. Everything is arranged via an easy to use “point & click” windows interface and does not require complex & expensive programming or changes to your applications. The advantage with AutoFORM LaserNet is that while it has a number of powerful facilities, you can purchase just the elements you need. This gives you an affordable means to meet your immediate requirements (or to avoid duplication of existing facilities) while being assured that you can extend the system as your requirements evolve. 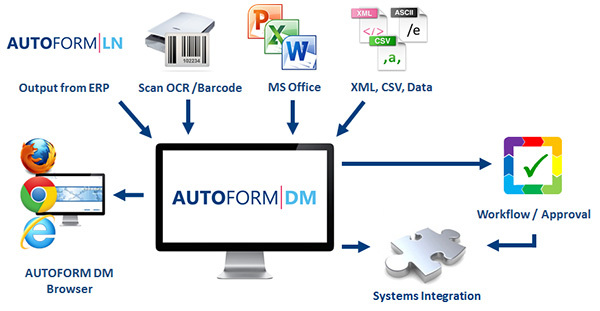 AutoFORM LaserNet distribution modules work in conjunction with AutoFORM Print & Archive. These provide additional opportunities to format your documents and archive them for browser or main application viewing. In all a total solution that allows you to automate many of your labour intensive administration tasks, leading to improved productivity and efficiency. AutoFORM LaserNet’s intelligent document distribution runs as a service on Windows Servers. Your applications output data is recognised, reformatted and distributed according to your pre-defned rules. For each document delivery method there are a number of advanced features to enable you to retain the control, personalisation and fexibility of individually sent messages with the cost advantages of volume transmissions. Prints any number of copies/variants where you need them – automatically. AutoFORM manages all your applications and all your printing technologies including: lasers, postscript, bar-code, impact dot matrix and specialist printers such as plastic card or ticket printers. Automates, controls and supports, colour, duplex, stapling, folding machines & tray selection, for time effcient document handling and posting procedures. Enormous cost savings can be achieved by switching some if not all of your document delivery to email, fax or XML. The advantage with AutoFORM is that the delivery choices can either be automatically or manually launched. AutoFORM adds the address and arranges for it to be delivered by the receivers preferred method. Output is sent as fully formatted documents attached to an email message via MAPI, SMTP compliant mail servers such as Microsoft Exchange (Outlook), Domino (Lotus Notes) and Groupwise. These emails can also be sent to network fax products such as Castelle, RightFax, Topcall, Faxination and ZetaFax. Attachments are sent in the customers preferred choice of PDF, XML, PCL, TIFF or plain text. AutoFORM sends formatted output direct to SMTP gateway products such as Castelle. This avoids network congestion caused by sending fax mail via centralised servers. Your standard print output can be converted to XML using either standard or custom schemas. This allows for documents to be processed by the receivers computer systems without manual input. AutoFORM LaserNet manages both the delivery and receipt of XML, normally as email attachments but any suitable XML channel can be used. Your main systems documents are sent from and to personal e-mail/fax addresses to aid ease of response. Routing information is collected from the original data or from your application’s address book. Every e-mail/fax transmission is sent with an automated pre-written personal message. Authorise before sending. For example: when a purchase order or a quotation exceeds a defined amount it is routed to the authoriser to be checked before being manually released for e-mail or fax. Automatically collects information from the attached documents and inserts it into subject header lines, e.g. “STATEMENT July 03 From XYZ Ltd“. This aids quick identification, filing and processing. Automatically attaches additional associated documents such as data sheets, terms & conditions or illustrations. One document can automatically initiate the sending of a complementary message. For example printing of a despatch note could trigger an automated e-mail despatch confirmation.